Since I was a little teeny tiny person, I’ve had a dream. A dream that so many others have had and still have today. A dream so unattainable and cliche yet real. I dreamed of fame and fortune and funny. But I’m not famous, I have no fortune and, as it turns out, I’m not nearly as funny as I’d like to think I am. I dreamed and dreamed and dreamed, but I never once was discovered on stage and invited to audition for Saturday Night Live. Not ever or even once. Craziest thing. I dreamed and I dreamed and I passed film sets slowly, dramatically and charismatically, but not ever once was instantly cast, on sight, in any feature film*, of any kind. Not as hot young mom dragging her brood of toddlers down the sidewalk to the bus stop in her pyjamas. Not as hot 30 something year old casually walking her dog through the park in her pyjamas. Not even as hot middle aged lady looking generally defeated and exhausted by life and the 346 pound 4 piece luggage/backpack/tote bag/laptop carrier set she drags to work and back every day. Yes Jo, I DO need all of these bags with me, every day, all the time, everywhere I go. They have my professional agendas, my personal agendas, my to do lists, my journals, my bullet journals, my artist journals, my lunches, my bottles of waters and cups of coffee and cups of after coffee tea in them. And also my work stuff. And kleenex and ginger chews and lip balm and a variety of 5768 different coloured pens and highlighters and gel writers and… stuff. But somehow I’ve managed to keep the dream alive. And I do that by allowing myself to nurture my inner artist. By living vicariously (read stalking) through others. And by living on fantasy island basically. 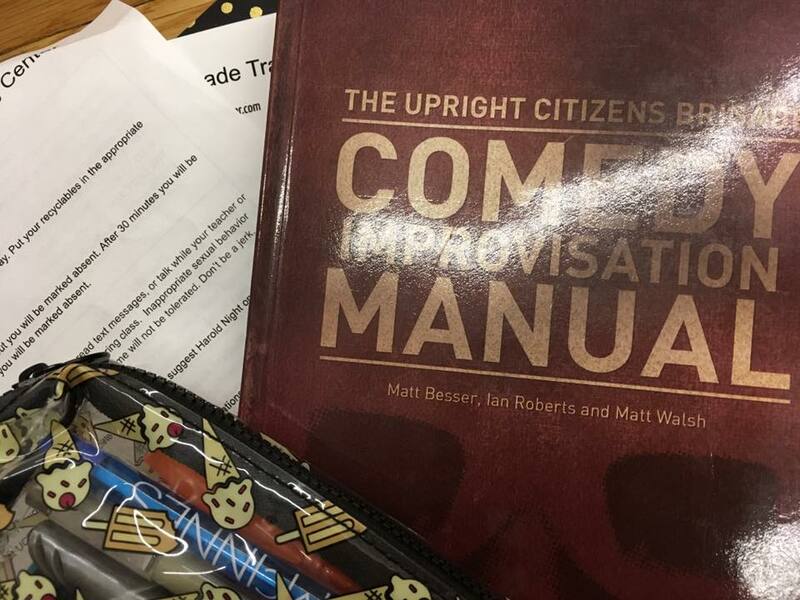 Going to New York City to study improv at the ONE AND ONLY United Citizen’s Brigade!! OH MY GOD! Can I just tell you, earlier this summer, thanks to my amazing super-mom, I spent one entire whole week in Manhattan doing/learning/watching basically nothing but improv all day and some nights. For those of you who don’t know, the Upright Citizens Brigade Improvisational and Sketch Comedy Training Centre, was founded by The ACTUAL Upright Citizen’s Brigade, Matt Besser, Amy Poehler, Ian Roberts and Matt Walsh. What? What? WHAT? Shut UP! I’m going to slay Improv 101, I thought. “Slay” is probably was massive overestimation of what I did actually do, but I gave it a good shot. I’m going to eat breath and sleep Improv performer, I thought. Which I’ve never been so I didn’t have much of a guideline… I didn’t do much eating, breathing or sleeping though, so I’m thinking I pretty much nailed it. I’m going to do this just like a real New York artist, I thought. And on account of my apartment being smaller than the bathroom of a tiny house, so basically a tiny apartment™*, which I’m officially trademarking here, on my very official blog, in case it’s not already a thing, even though I’m pretty sure that tiny apartment™ is basically just a New York apartment, for anyone who makes less than 12 figures. And the view from the one window of my tiny apartment™ being that of a brick wall and the vents of about 6 other tiny apartment™’s air conditioners. I might be wrong but I think that maybe what Frank Sinatra meant by “make it there” was actually less a reference to becoming famous as it was a reference to just actually surviving. Like… “I just spoke to the doctors… they don’t think he’s going to make it.” kind of make-it. I’m serious! I arrived in New York, Sunday around noon, dropped my things off at the apartment and walked the streets of Manhattan until after 8pm just looking for a bottle of wine for under $20.00, and any fresh produce… at all. It’s a wonder I didn’t have scurvy by the time I left! The first couple of days I fully embraced the vibe of the city. I’M A NEW YORKER! I skipped over puddles of vomit, like Gene Kelly dancing in the rain. I sang good morning to the rats in the gutters, gave change to homeless people and plowed through the piles of tourists like a local. The constant noise was romantic hustle and bustle, and as an added bonus, it drowned out the sound of my tinnitus. THIS IS SO NEW YORK! I squealed with delight. I’m at home! I’m in my element! I’ll have to be dragged back to Montreal, kicking and screaming, I thought. Monday morning I arrived at UCB to realize that my presumption that everyone in my class was going to be 20-30 years old was basically true, only there were even younger students than that. 2 girls as young as 16 years old. Most of whom as young as not knowing who Brooke Shields was when she sauntered down the hallway past our class room. I reminded myself that this was a once in a lifetime opportunity and that age didn’t matter, and that adults had to perform with me when I was a child and an annoying teenager***. And that we all have something to learn from each other. I felt a little out of my element to begin with but by lunch time I was fully engaged. And I did learn a lot, from everyone in the class. In the following days, I had learned so much and exercised my brain so hard, that I seem to have come home missing half the nouns I went there with. Despite the grandiose ideas I’d had of starting each morning by practicing yoga or running in central park, followed by a full day of classes, and hours of writing each night. Maybe I’ll finally finish the rough draft of my series of personal essays! (I thought.) I was so exhausted by the time I got home each evening, that some nights I was even too tired to watch Television. Our instructor was John Timothy. He was exceptionally difficult to read for the first few days. He spent a remarkable amount of time squinting at the knees of his pants as he rubbed his temples in what I could only interpret as deep emotional turmoil. Is he a later riser? Is he hungover? Is he questioning his career path? Are we the least inspiring class he’s ever been assigned? “Good good good..” He would almost mumble. “Let’s try not to *insert whatever it was that we were doing* and try to *whatever it was we should have been doing instead* with this next one” he’d wince. And while at first I was doubtful of his abilities, as the day progressed I realized he was actually teaching us, and we were actually learning. And it felt amazing. By end of the week he was laughing with us. Or at least at us. I think. The night of our performance, he ran on stage to introduce us, with an enthusiasm I would never have known he was capable of until that very moment**. 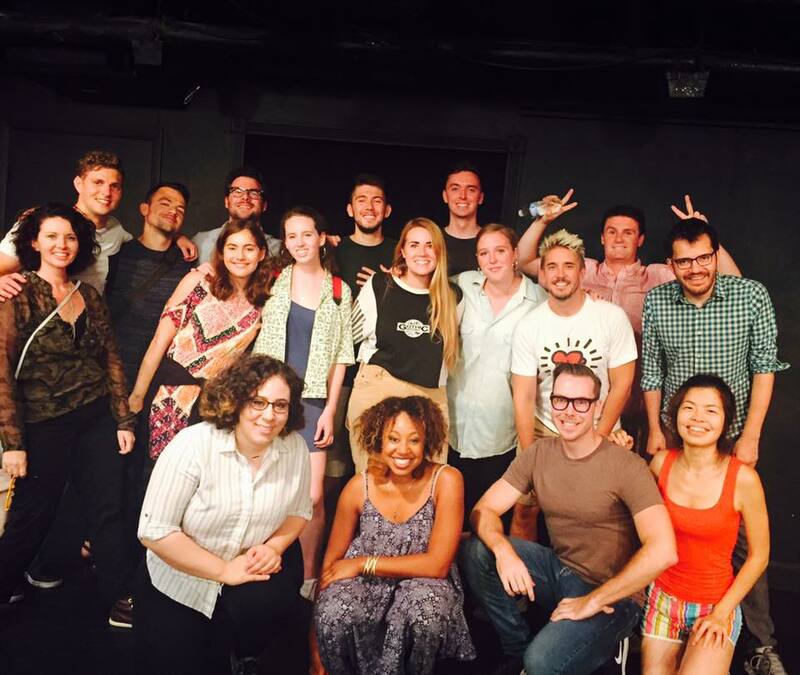 My class performed on the Saturday night at UCB Chelsea, and we had so much fun. On top of the obvious thrill/embarrassment of being amateur improv artists doing our first show together, the honour of doing it on the very stage that has been graced countless times by the genius of Amy Poehler, Matt Besser, Ian Roberts, Matt Walsh and Kate McKinnon, and the talented likes of Rob Riggle, Horatio Sanz, Ellie Kemper, Bobby Moynihan, Aziz Ansar, Abi Jacobson, Ilana Glazer and so many many many more… was SO EXCITING!! and then later in the week, some inspiring and excited thoughts about what’s to come in what is left of this life ahead of me. It was terribly difficult to leave UCB but I didn’t have to be dragged kicking and screaming out of New York. The noise started to get to me, the tourists got on my nerves, I ran out of change, I got bored of my brick wall view, I feel an unreasonable and possibly irrational amount of anger toward the M&M store, and my heart broke when I saw what they’ve done to the inside of Macy’s. I still ❤️ New York, and I’m so deeply and profoundly grateful for having had this awesomely inspiring experience, to have had the opportunity to work with such gifted team of performers, from all different backgrounds of all different ages, and to have had John as a teacher. (B) – Pass? Oh reeeeeally… ? Challenge accepted. See you at Improv 201 UCB New York. ** John’s team performed right after ours and it was an honour and a joy to see him in his element. He’s a great performer and if ever you have the chance to check out his team, The Curfew, you absolutely should. ***The kids in my class weren’t at all annoying. I wish I’d been as smart and mature and driven and ambitious and cool as them at their age. Or even now, for that matter. Next Post - Next post: Shame on you IKEA!